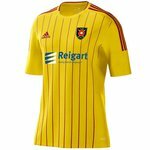 Rogues Hall of Fame | Albion Rovers F.C. A bit of fun and a chance to nominate someone who's done yer heid in. I'll set the ball rolling with John Beaton for allowing that goal at Ibrox! scored an injury time penalty for east fife 15 mins after our game finished to stop us being promoted. How about the female announcer at Methil eh Chris? On that note how about the Rev I M Jolly on the tannoy at Cowdenbeath! Not to mention our announcer(s) too! I think myself and quite a few older members would nominate Auld Tam, especially his campaign to stampout any fan who expressed their disagreement with him!